Reflections of Prof. Padmanabh S. Jaini, Professor Emeritus, University of California-Berkeley, on Jainas and Jainism. JAINISM is a religion, broadly speaking, of “listeners” and teachers, over and above whom are the liberated souls, the ford-makers or Tirthankaras. There was yet another “assembly of listeners” (to borrow a phrase used in one of the edited volumes on Jaina society1), converging in the sweltering heat of Delhi in early June, to listen to Prof. Padmanabh S. Jaini share reflections and insights on Jaina epistemology and the history of the Jaina tradition in India. Jaini was the key resource person at the International Summer School of Jaina Studies (ISSJS) recently held at the Lal Bahadur Shastri Sanskrit Vidyapeeth in Delhi. The ISSJS was initiated in 2005 as a platform to bring together academics, students and others interested in Jainism and enable them to share the doctrinal and experiential facets of Jainism. The Indian programme was designed to give scholars a course in Jaina tradition through classroom lectures, interactions with the Jaina community and visits to Jaina pilgrim places. It started with just seven scholars in the year 2005 and the number increased to 28 in 2008, mostly by word of mouth. The ISSJS is also planning to establish research centres in Jaina studies. The first step in this effort is the setting up of the Global Centre for Ahimsa and Indic Research at Parshwanath Vidyapeeth in Varanasi. Organisations collaborating with the ISSJS include the University of Ottawa, the American Institute of Indian Studies and the Shastri Institute of Indo-Canadian Studies. Besides, there are coordinating units or partners in Texas, London, Hawaii and elsewhere. Jainas have been a minority religious sect for some centuries now. Many would not even know the distinction between Jainas and Hindus on account of the relative obscurity and “silence” on this sect in Indian history and sociological studies. Jainism was one of the original Indian non-theistic traditions besides Buddhism that emphasised individual effort towards self-realisation and ultimate liberation without a god concept. Ahimsa (non-killing), right faith, conduct and knowledge and non-possession (aparigraha) in everyday life takes an individual to that ultimate liberation. It was founded around the same time as Buddhism (though scholars believe it pre-dated the latter). However, there are relatively few works on Jainas in history when compared with other traditions. And if more and more people, especially in the West, are now turning their attention to Jainism, the credit goes to scholars such as Padmanabh Jaini, Paul Dundas and Peter Flugel. 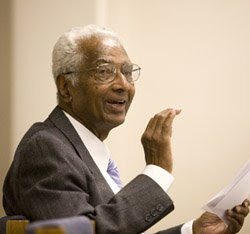 Although Jaini began his academic career with a study of the Buddhist tradition, it was his work on Jainism (later in his career) that earned him greater worldwide recognition and gave Jaina studies a high profile in the academic community. He is the most respected name among the Jaina community worldwide; Jaini’s scholarship is vast and his knowledge of the scriptures in Prakrit and Sanskrit (not to forget Pali) makes him one of the rare scholars of the old tradition who tirelessly update his knowledge and perspective and constantly writes on various aspects of the Jaina tradition. Jaina taught at the School of Oriental and African Studies in London before joining the University of Michigan, Ann Arbor, in the United States. He retired as Professor of Buddhist Studies at the University of California-Berkeley, where he is currently Professor Emeritus. His best known works include The Jaina Path of Purification (1979), Gender and Salvation: Jaina Debates on the Spiritual Liberation of Women (1991), Collected Papers on Jaina Studies (2001), Collected Papers on Buddhist Studies, and several papers in international journals of repute. Philosophy and epistemology (in both Buddhist and Jaina traditions) have been his forte. However, Jaini wears his scholarship lightly. He spared his precious time for a conversation with the writer outside his tight schedule of daily lecturing. Following are excerpts from that conversation, supplemented by reflections on his approach to the subject and the course; and excerpts from his well-attended talk at the India International Centre (IIC) in Delhi on June 6, on “Heavens and Warfare in Buddhism and Jainism” (the latter added on request by the Jaina community). Jaini’s lectures reflected the importance he gave to comparative analysis of religious or philosophical traditions in their contexts. His knowledge of Western traditions – religious and philosophical – to which he made several allusions, is vast. Pointing out the logical limitations within traditions, he would make us see the Jaina point as reflected in the canons and the post-canonical developments in Jaina thought and remind us at the same time that he was not passing judgment on other traditions. His reasoning for those limitations would make us review and revisit some of those limitations from a purely epistemological or logical perspective and draw our own conclusions. His intense lectures brought home the importance of approaching Jainas as a community through its philosophy. H. Jacobi was among the earliest scholars to bring to the notice of the Western scholar the Jaina canonical text Ayaranga Sutta (Acaranga Sutra) in 1882. Incidentally it is one of the earliest publications of the Pali Text Society. And within Jainism, Western scholarship laid more stress on the Svetambara Jaina tradition than on the Digambara tradition. As for the summer school and its relevance, he said “coming to India itself is an educating experience [for those coming from outside India]. Mere classroom lectures and reading texts cannot be of great benefit as living in a place like Dadabari [a Jaina retreat of sorts in Delhi, where the scholars stayed during the course] can. Dadas are not tirthankaras; and this place is not something traditional Jaina monks would encourage. Jaini’s talk at the IIC seemed appropriate in the context of the Sri Lankan situation at present. He believes that the war may be over in Sri Lanka but the struggle is far from over. But he had started to contemplate on the situation by means of a simple question: “Where do you go when you perish in war? Does a person who dies in war go to heaven?” And, as he said at the talk, this question led him to the Buddhist chronicle of Sri Lanka, the Mahavamsa. But, since Jainas were as eager to know what their texts said about the same question, Jaini included reference to the same question in the Jaina canonical text, Bhagavati Sutra (Vyahapannati, Book VII). World religions such as Judaism, Christianity, Islam and the Indian Vedic tradition (and Krishna urging Arjuna to fight) speak of the concept of war and of warriors attaining heavenly abode if they are killed in war. What do the Jaina and Buddhist religions have to say to that? Speaking of war in these two non-theistic traditions, Jaini said the Mauryan emperor Asoka was the only king in the history of the world who ever apologised for having killed and for war. It was one of the rare occasions where tradition and praxis converged. The Mahavamsa mentions the war between the Sri Lankan king “Duttha Gamini” Abhaya (101-77 BCE) and the Damila (Tamil) king Elara, where the latter is killed. Apparently, Abhaya ordered the people of his kingdom to pay respects to the fallen Elara by observing silence when they passed the site of his death. Abhaya is filled with remorse that thousands died, and suffers. Eight Buddhist arhats come to pacify him and absolve him of his wrongdoing (killing in war). Their reasoning, which convinces him, is that he after all killed just one and a half men; the rest were “unbelievers” – those with mithya-ditthi (non-Buddhist in the context of the Mahavamsa). They say to him “as for thee thou shall bring glory to Buddha…” and therefore convince him there are no obstacles in his passage to heaven. According to Jaini, mithya-ditthi should be understood as a term used for one who does not believe in life after death. But in another text of the same tradition, there is a contradiction. Samyukta nikaya – in a dialogue between a “yodha-jiva” (one who made living from fighting) and the Buddha – gives a different meaning for mithya-ditthi. There the Buddha says that a person who kills is reborn in purgatory (avichi), especially if that person kills with the view (mithya-ditthi) that he would go to heaven therefrom. The Mahavamsa obviously gave a different meaning to the term to absolve king Abhaya of his crime of killing. In the Jaina tradition, Somadeva Suri (10th century ACE) spoke of defensive war, yet was silent on the idea of death in the battlefield. Jaini showed the differences between Jainism and Buddhism on violence and killing. It was only after Varuna offered to renounce all (aparigraha) and give up violence of all kind that heaven became accessible to him; in the Buddhist text, the killing of one and a half (‘only’) “believers” and thousands of “unbelievers” assured king Abhaya a place in heaven. The importance of non-violence in all Jaina texts is highlighted through this story. These are two traditions that do not believe in a god concept. It is important to see their perspectives on warfare and its rationale. R. Uma Maheshwari is a freelance journalist based in Hyderabad and has a doctorate in the history of the Tamil Jaina community from Jawaharlal Nehru University, New Delhi. 1. Michael Carrithers, Caroline Humphrey, eds; The Assembly of Listeners: Jains in Society, Cambridge University Press, 1991. 2. Jaini, “The Jainas and the Western Scholar”, in P.S. Jaini, ed; Collected Papers on Jaina Studies, Motilal Banarsidass, Delhi, 2001; page 23. 3. More often it is the wealthy (Svetambara) Jainas of the north who figure in commonplace perceptions about the Jainas. But there is a relatively hidden, relatively poorer (or middle-class) section among Jainas, and these are most often the Digambara Jainas. Their temples and images of tirthankaras therein are in sheer contrast to the ones found in Svetambara (ornate, rich, marble) temples; in the latter the eyes of the tirthankara image are open (with their bodies decorated with precious stones, jewellery and so on) in striking contrast to the austerity preached in the original Jaina doctrine. Digambaras take umbrage at this representation and there are usually conflicts between these two sects over the takeover of certain older Digambara temples and sacred places by rich Svetambara Jainas. And Digambara Jainas also state that their history and antiquity are being wiped out by the Svetambaras. Then there is the centuries’ old debate between the two sects over the antiquity and authenticity of their scriptures and practice.